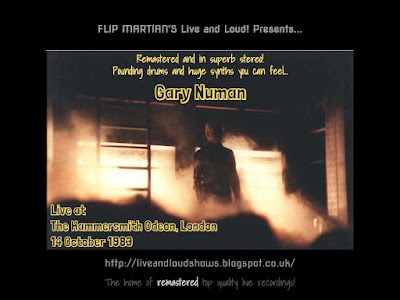 We haven't featured Gary Numan for quite a while - Considering he has a career going back to 1977 there aren’t actually that many good quality live recordings lending themselves to the Live and Loud! treatment. However, we have recently obtained a couple that can be done so here’s the first of them! This was originally a radio broadcast (hence the edited setlist, sadly!). I had a copy of this on tape from 1983 for a long time which was great quality - but lost that some years back and the only copies I could find were poor recordings and low bit rate mp3s. One copy was even in mono!! So it was good to find a decent copy again (and my thanks to Stephen for letting me have these!). It was rather flat but otherwise in good condition, so not much repair work needed. Instead I spent a lot of time EQ'ing it. It was worth it - if you like your tomtoms aggressive and your synths to make your spine quiver, then you've come to the right place with this one. Loudspeakers please, or at least decent headphones - you'll really notice the difference, even if you have this recording already from elsewhere! :-) Enjoy. An underrated period for Numan. Solid band, and some great arrangements. They should locate the source recording and issue it as Living Ornaments '83. If they do, they could use this remastering as a guide--amazing job! Thanks! Agree with you on the arrangements the reissuing it - shame its not on official release really. Thank you thank you , i had a tape of this in the 80s , love it, bringing tears and good memories or one of my fav musicians. That's what this site is about - good musical memories. Glad you enjoyed it.